The stainless-steel CM225 attaches one pyranometer or quantum sensor to a mast, crossarm, or pole (1.0 to 2.1 in. OD). Many pyranometers and quantum sensors also require a leveling base that secures the sensor to the CM225 as well as level the sensor. 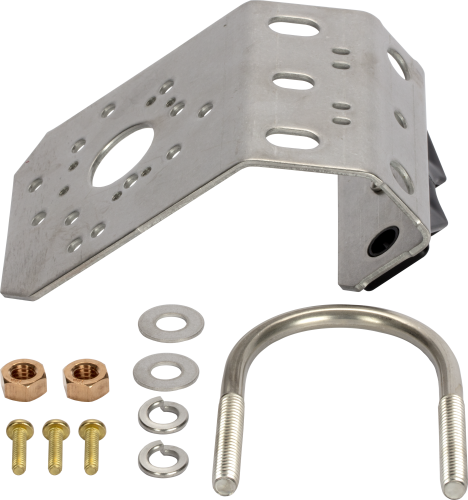 The CM225 consists of a rectangular plate, mounting bracket, U-bolts, lock washers, and nuts. LI200R-L Requires the LI2003S Leveling Base. LI200RX-L (retired) Requires the LI2003S Leveling Base. The CM225 can mount to a pipe with a 1 to 2.1 inch outer diameter.